This was a complete dream, to design, to reality kitchen remodel that closely followed the Pool Brothers process. From meeting to discuss design concepts, to reviewing the layout in our 3D rendering software, to selecting materials carried in our showroom, then moving into the construction phase … these clients and their remodel were a real pleasure! Originally, this kitchen had a dividing wall that separated it from a formal dining room. This made for a smaller kitchen and an isolated dining room that our client really didn’t want or need. Together we dreamed of taking down that wall, creating a bigger kitchen, and creating a wonderful space where friends and family could comfortably gather well into the future. We envisioned an island as a central place where people came together, enjoyed one another, and made lasting memories while cooking and eating meals. We were able to open up the space by taking down that dividing wall and created a warm, inviting, and much larger kitchen space. The striking marble countertops, grey subway tile backsplash, white cabinets paired with grey stained wood on the island … these features all look fantastic! But if you look closely, you’ll notice heart pine featured throughout the kitchen. This even matches tall pines outside the home! We custom built the gorgeous heart pine hood and paired it with matching floating shelves over the kitchen sink. To keep the hood as an undistracted focal point of the kitchen, we tucked the microwave away in the island to keep it out of view. 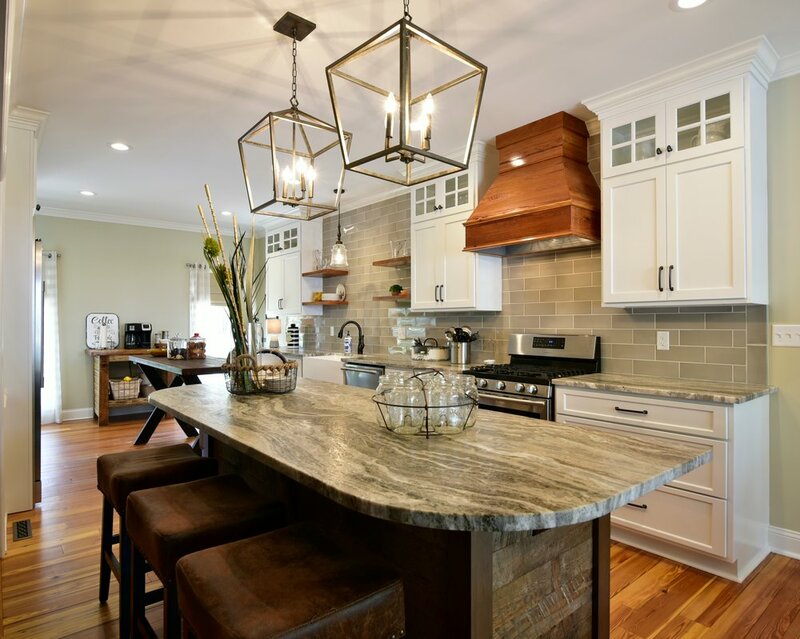 The center island also uses reclaimed heart pine, further making it an accent piece to this kitchen’s design. When taking down walls, this can create a unique challenge filling in the flooring, hiding seams, and giving the floors an appearance that flows and removes evidence of the missing wall. Using our flooring expertise, we were able to conquer that challenge, match the beautiful heart pine throughout the house, and create the quality look the floor in this kitchen deserved. Whether it’s for big family gatherings on holidays, or a quick bite to eat on a regular day, we hope this family enjoys their kitchen for years to come!